Reflecting the growth of international interest in Latin America & the Caribbean as cruise destinations, French Luxury & Expedition cruise line PONANT has released an extensive range of voyages covering the period October 2018 - April 2019. 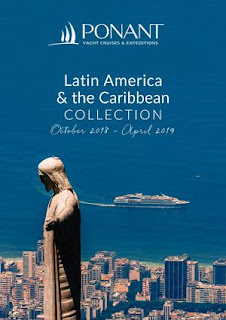 Featuring a range of 21 cruises (10 being designated Expedition Cruises) to 26 countries - exploring both east and west coasts of South America and the Caribbean - this new Collection is available as either a convenient e-brochure download at https://fr.calameo.com/read/000132423327d2f10ea6d or as a printed brochure on request through travel agents or directly from PONANT. No less than 26 listed UNESCO World Heritage sites and 5 major pre-Columbian era sites hint at the range of destinations to be had. From ancient Mayan and Inca civilisations, colonial cities, extraordinary jungles with colourful wildlife and massive waterfalls, to the Guiana space centre, monasteries, salsa and mojitos. Guests will discover a multitude of experiences from on board PONANT's modern and luxurious ships: Le Boréal, L'Austral & Le Soléal as well as the new-era Explorer Class ship, Le Champlain, and PONANT's classic three-masted yacht, Le Ponant. Once-in-a-lifetime experiences include expeditions along the great river arteries of South America, the Amazon and Orinoco, visiting a remote Warao Indian village, reliving the hell of Papillon on the French penal settlement on Devil's Island or sipping a mojito while listening to jazz in Havana. Others will seek the thrill of rounding famed Cape Horn, cruising the Beagle Channel, crossing the Panama Canal or venturing deep into the pristine waters of Chilean fjords. Accompanied by a specialist lecturer to enhance the experience, the voyages provide opportunity to travel to the birthplace of ancient civilisations and view the archaeological enigma of the gigantic Nazca Lines, Mayan Tikal and Inca Machu Picchu. Some voyages are designated Expeditions, taking advantage of the ships' compact size and manoeuvrability to probe hidden waterways, before launching Zodiac® expedition boats for adventurous close-up opportunities of local flora, fauna, and local tribes. Throughout Expedition cruises, an expedition team of naturalists will enhance the experience. For those looking for the relaxed pace of longer voyages why not consider a Grand Voyage? There are three to select from: 49 nights Ushuaia to Miami exploring the west coast of South America and Central America, featuring a sparkling range of experiences from glaciers to rainforests; an extended 59 night version from Vancouver to Ushuaia along the west coast of North and South America, or an exciting 37 night Grand Voyage on the new ship Le Champlain from Brazil to the Caribbean and on to Panama … Manaus to Colon - an expedition and luxury voyage extraordinaire - with Christmas and New Year in the Caribbean.… Imagine a Creole Christmas dinner of lobster, pork and rum. Find out more, enjoy French ambiance on the world's youngest fleet afloat and experience the difference small ship cruising offers. Venture where large ships simply cannot, with a dash of French panache that is PONANT's indelible signature. Pricing is yield managed and will increase as cabins are sold so it is recommended to book as early as possible. Contact your travel agent, or PONANT on Australia: 1300 737 178 or + 612 8459 5000 / New Zealand: 0800 44 32 62, or email reservations.aus@ponant.com.